“A rose is a rose is a rose” Gertrude Stein wrote in a famous verse. Many things can come from a simple rose: a meeting, an exchange, a morning to remember. Jakob arrived in our city wearing a smile and the desire to discover the beauty of places and people who live there. Meeting him was for us the beginning of a wonderful adventure, that of our Sightseeing Running Tour start up business. Actually, we could not have asked for a better start. When the #LawOfAttraction shows it´s incredible power it sometimes leaves me speechless. Such as today in #Bologna. While wandering through the empty streets of the early morning old town, intuition told me to buy a rose at the flower shop I´ve just passed. I followed the advice and gave it to the next female person that had come across my way. With no intention but helping her making this morning a good one for her. Her smiling all over the face told me that this goal was more than achieved. This simple act of giving away joy has made a remarkable transformation of my own energy as well. I connected to my environment in a very pleasurable way, my self-esteem has increased and gave my confidence a massive boost. Not even five minutes later I found myself chatting up this dude Andrea on the street who was dressed in running gear. It turned out that he was just about to start his new business called #BolognaByRun showing tourists the curiosity of his city in running shoes. We agreed that I should be his first test runner. Shortly afterwards I found myself dressed in sort of sporty clothes joining him for an 8km run through the awesomeness of Bologna. Andrea as a local was equipped with remarkable knowledge and a quite helpful sense of orientation. I could have not imagined a more delighting way to explore Bologna, especially not at 7am. And he was happy with my feedback as a pilot. We created a powerful win-win-situation and added beautiful value to each other´s morning. The message of this story: Give away #beauty and you´ll attract beauty. The more you give the more you get. Cheers! We like to think that nothing happens by chance and that Jakob’s gesture to offer a rose to a stranger was not only –as he says – “to make a better day” but led directly to a reward: that of bumping into Andrea a few minutes later. So Jakob became the first tester of one of our running itineraries. And Bologna, that morning, was astonishing while waking up from the first light of dawn. Bologna is our city: she has nursed us and nurtured us in her maternal belly, educated us with her culture full of history, legends and splendid medieval monuments, amused us thanks to her nightlife crowded of interesting locals and unforgettable people. 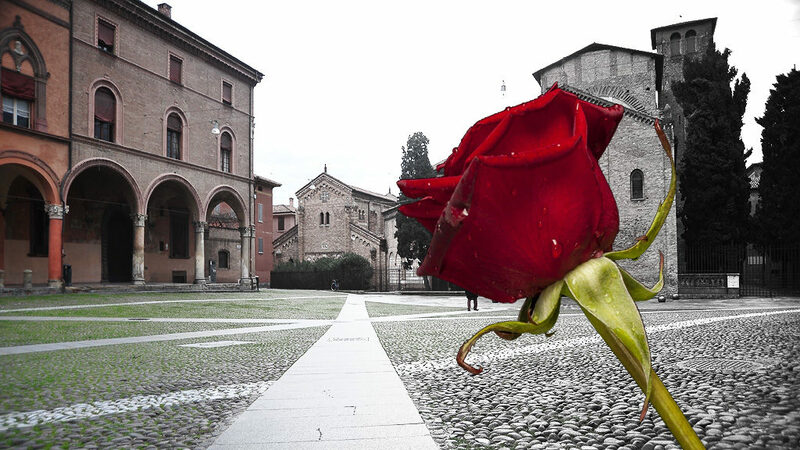 Bologna is our city, but she is also the city of whoever wants to get to know her, as she will welcome everyone either forever or only for a short time. Jakob was our first encounter and guest: we are sure that, after him, many other lucky encounters will follow. If they will decide to have a run with us in our beloved Bologna, we promise a difficult-to-forget experience. PS: by the way, if you are curious about Jakob Horvat’s journeys, follow his travel blog at https://www.thousandfirststeps.com/ and see how much he has been traveling since then.